We all know the composite, but what is this door made out of? Composite doors are primarily made up of veneer lumber; this type of wood is tough and resistant to water damage, creating a firm inner structure for the door. This lumber is usually laminated with a strong, solid coating to reinforce the material and allow it to keep its shape. The main composite door slab is usually 44mm deep; this is almost twice as deep as your standard PVCu door, therefore you can guarantee effective protection from criminals. Most thieves or trespassers can cut your standard PVCu door in less than 3 minutes, however a composite door is almost impenetrable. The 44mm slab brings many advantages to your front door (literally) including a reliable sturdy door that will last for years on end. Heat loss is measured via U-Values, when it comes to doors; composites have always won in regards to providing the best energy efficiency. But what causes a composite door to insulate so effectively? There are many factors that contribute to a composite doors excellent thermal insulation, for one the door has a much wider construction in comparison to a standard front door. The heavy reinforcement of a composite do excludes draughts entirely and repels cold temperatures. With a thick, opaque build, heat is forced to stay inside of your home, therefore saving you money on your energy bills and keeping your room warmer during the colder months. Composite doors have an outer layer, which protects the main composite slab. A thin skin of GRP (glass reinforced plastic) is laid over the mainframe to protect the door from weathering, the GRP also provides a realistic timber effect fort eh door, allowing homeowners to achieve a variety of wooden finishes. GRP is known for its tough and aesthetic properties, therefore the highest quality of composite doors will often be layered by a GRP skin. Some composite doors come apparent with windows, however these styles have still been reworked to provide the best durability and energy efficiency. The windows for composite doors are typically double or triple glazing; this is so thermal insulation is still kept even with the addition of windows. If you’re buying a composite door, the one thing you will always be guaranteed is optimum energy efficiency. The reason for composite doors never fading or bleaching is due to the fact that their colouring is not on the outer surface. When a composite door is manufactured, the colouring is present only within the GRP, therefore no wear and tear or weather can deteriorate the colour or finish of your composite door. The handles for composites are usually PVCu, but this is because PVCu is the most suitable material to use for the most used feature of your door. The PVCu material will never become malleable and the high quality will last for a long time, even when exposed to daily wear and tear. Just like the composite doorframe, our composites are also available with a number of different handles; therefore you can find handles with all kinds of unique benefits. We have both long handles and short handles, including handles with implemented locks all to help our customers find the most ideal handle for their door. Like the sound of a composite door? Has the composite door won your heart yet? Composite doors have been newly manufactured to provide the best energy efficiency; you can expect a draught-free house all year round. 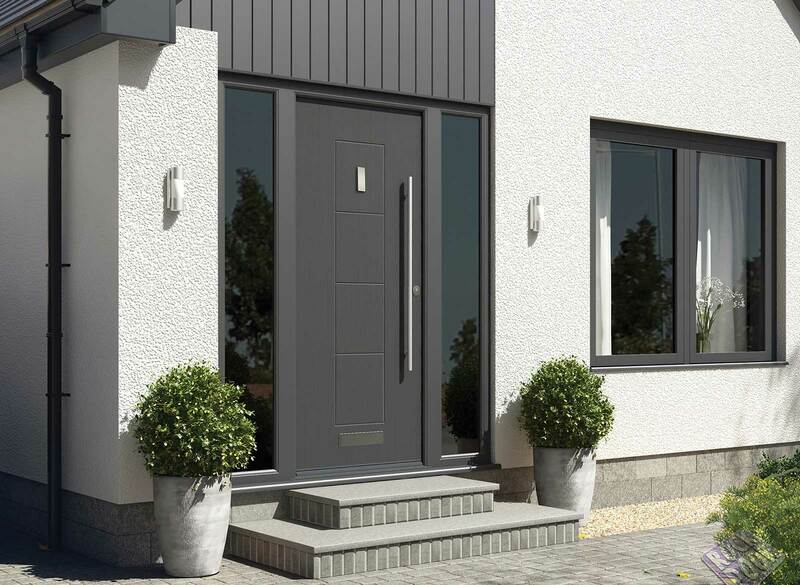 Composite doors have been given that little bit extra thought, door manufacturers want to create a door that helps homeowners achieve the best of everything, whether that’s reliability, durability and aesthetic. If you’re looking for a door that will give you and your home the most useful and effective benefits, then a composite door is the style for you. For a non-obligated quote get in touch with Elite Windows today. What Is Inside Of A Composite Door? Everyone knows a composite door for its beautiful aesthetics and excellent strength. Composite doors have been built with reinforced structures, helping the door to withstand harsh weather and colour deterioration, if you want a door that lasts it is always a composite door that is recommended. However, despite homeowners admiring the composite door for its elegance and sturdy properties, many of us don’t even know what makes up the composite door. Door manufacturers and carpenters have used the newest of scientific evidence and home improvement technology to create a door, which guarantees excellent longevity. There are several layers that make up the composite door and all of these materials have a purpose to help the composite door achieve the energy efficiency and durability that it does.